A new defensive Unit for Link Joker appears. CONT (RC) GB1: If your opponent has a Locked card, this Unit gains “Intercept” and “CONT (RC): This card can Intercept from the back row.”. Tpoday, “Dragon King’s Awakening” finally goes on sale. It’s a full force product that contains powerful cards for 《Nubatama》, 《Shadow Paladin》, 《Oracle Think Tank》, 《Gear Chronicle》, 《Narukami》, and 《Neo Nectar》, while the Generation Rares are super powerful ace cards 《Shadow Paladin》 and 《Nubatama》! Since SGR Cards are extremely rare and have very beautiful foiling, if you get your hands on them, be sure to add these card to your Decks! When building your Deck, be sure to consult the official Deck Recipes, which contain cards from “Dragon King’s Awakening”! 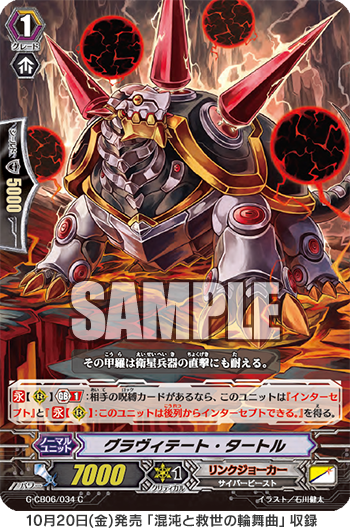 And to continue, “Gravitate Turtle” from “Rondeau of Chaos & Salvation”, if an opponent’s card is Locked, this card gains 『Intercept』 and 『Intercept from the Back Row』. It’s a card that works well with the “Star-vaders” who specialize in 【Lock】, meaning you can further improve your Defenses! “Rondeau of Chaos & Salvation” contains a ton of “Star-vader” ace cards, so look forward to future information!